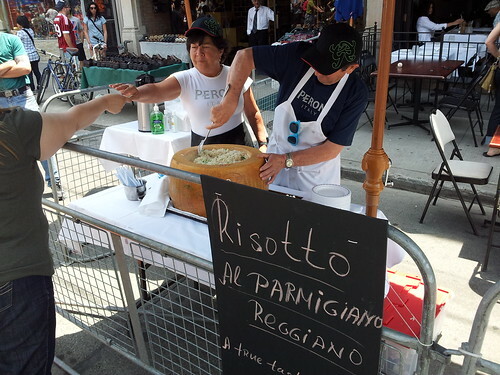 The Taste of Little Italy street festival is a decent event for food — lots of interesting vendors, and generally some pretty good eats to be had. However, every year there’s one clear highlight, and that’s the Risotto al Parmigiano Reggiano served up by La Forchetta Ristorante. Oh man, that risotto. It’s pretty basic: it’s got some green onions for colour, sometimes some chopped asparagus (though I didn’t taste any this year) but it’s otherwise no-frills risotto. I think what really pushes it over the edge is the big wheel of Parmigiano Reggiano that they serve it in. The Italian cheese melts generously into the rice, giving it a luxurious richness, and a really satisfying, almost nutty flavour. As they serve it, they scrape the bottom of the wheel with the spoon, ensuring that each serving is as packed with cheese as possible. It’s seriously good.